For over three decades now, Captain Moe’s Lucky Fleet has provided one of the most enjoyable fishing experiences to patrons from all over. As one of the best fishing charters in Key West, Captain Moe’s Lucky Fleet offers experience, knowledge, and all the right tools and techniques to help you catch your dream fish. While sailing the ocean, surrounding flats, and local harbors, our experienced staff will regale you with all manner of entertaining stories about capturing the big fish one long afternoon. Your charter will be an experience to remember! Here at Captain Moe’s Lucky Fleet, we love a grand challenge. That is exactly what specialty fishing is all about, and it’s why we’re one of the best fishing charters in Key West. It is all about the challenge, the thrill, and the overall experience. Imagine telling your friends or workmates about battling it out with a hammerhead shark or a deep-sea species few have ever seen. Imagine the pictures you can capture upon reeling in that big catch! When you put your trust in Captain Moe’s Lucky Fleet, you’ll be in good hands the entire way. Each of our staff members are trained professionals with years of experience in Key West. 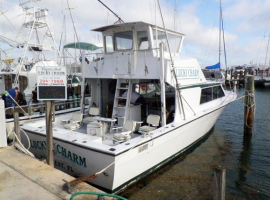 We currently have three well-maintained boats to charter: The Lucky Charm, Reel Lucky, and Reel Lucky Too. Captain Moe began building his expansive fleet in 1998 after spending 12 years on the world’s largest sailing yachts. Today, the fleet has grown in size and capability. The crew aboard each boat is handpicked by Captain Moe himself, then trained thoroughly before setting sail. When you call Captain Moe’s Lucky Fleet at 305-304-8065, you will speak directly with the captain of the fleet itself. This is your chance to book one of the best fishing charters in Key West for a memorable experience!